Earlier this week, I posted that I was in San Francisco for a few days. It's always strange to visit a place that you used to call home. I've mentioned before that I spent a few years in the city — six months after graduating from college in Portland, I landed my first full-time job and packed my bags for San Francisco where I spent the subsequent next two or so years. When people ask me why I left San Francisco, I always hesitate before I tell them the truth: that I've never been the city's biggest fan. It's hard to say that about one of the world's most beloved cities, but when I lived there, I found the city to be crowded, under-resourced, overpriced, stressful, and dirty. There was a line for absolutely everything — to even ENTER the supermarket, for instance. I've had the opportunity to go back to San Francisco a few times since moving away, and I find myself enjoying the city more and more with each visit. At first I attributed it to the fact that some of my best friends still live in San Francisco, a far departure from when I first moved there and literally only knew two people. It also helped that I didn't have to deal with navigating and finding my way around the city on my own, as I did when I first moved there. My most recent visit was particularly special though. Maybe it was the fact that I got to hang out with some good friends that I hadn't seen in years. Or that I'd been blessed with a week of bright blue sky and 70-degree weather. Or that I managed to go to all of my favorite places in the city without too much of a wait. All those things combined into one giant realization: perhaps I didn't give the city the chance that it deserved. There are always going to be a lot of things about San Francisco that leaves a bad taste in my mouth. For instance, how the city fails to provide enough resources or support for its large homeless population while the rest of the city booms from the success of the current tech bubble. The fact that the average rent for a tiny two-bedroom in a sketchy neighborhood is around $2500, and good luck finding a decent place if you're not working at a fancypants tech company. But this time, I see that there's good too. Tartine's Lemon Cream Tart. Blue Bottle's New Orleans Iced Coffee. The Farmer's Market at the Ferry Building. Catching your favorite food truck hiding in a tucked-away alley between buildings. How you can get great Chinese, Burmese, Mexican, French and American food all in the same neighborhood without ever needing to use any other mode of transportation besides your feet. And of course, the triumphant feeling of getting a table with your friends at a crowded bar/popular restaurant and finally sinking your teeth into their signature dish. This recipe comes from the Mission Street Food Cookbook, a cookbook from famed San Francisco restaurant Mission Chinese Food. I've already professed my love and gratitude for the restaurant in my post about their sour cream brownies, so I won't bore you with the details. What you see above is a French toast recipe with a twist — instead of using an egg and frying the bread over the stovetop, this recipe toasts the bread, before dipping it in a hearty bowl of sugar and brûléeing it with a torch, and topping it off with some cream and sweetened condensed milk. The result is a breakfast/dessert that tastes like a bowl of Cinnamon Toast Crunch cereal and a ramekin of creamy crème brûlée all at once. The varying textures (the crunch from the brûléed sugar, the milky texture of the bread once it absorbs the cream) is absolutely heavenly — think bread pudding, or a tres leches cake. And it was worth it, because I feel like this cinnamon french toast crunch really fits the bill — it's a dish that captures San Francisco, not only as a culinary destination, but as a city as a whole. A dessert from a beloved San Francisco restaurant: Made from high-quality ingredients. Novel and familiar at the same time. Playful yet slightly pretentious (because what breakfast dish needs a flame torch?). And of course, absolutely decadent and irresistible. It's the San Francisco I've come to know and love indeed. Minus the long wait at the door. 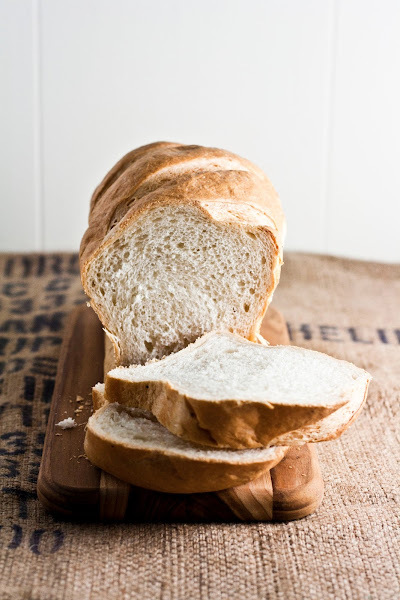 If you're working with a loaf of pain de mie, slice the bread into 1-inch slabs and spread 2 tablespoons of butter on each slice of bread, 1 tablespoon on each side — I know that sounds like a lot, but it's okay! It's dessert... right? Toast or bake the buttered bread until the edges are lightly browned. Once the edges of the bread are lightly browned, remove from the oven and place on a cooling rack. 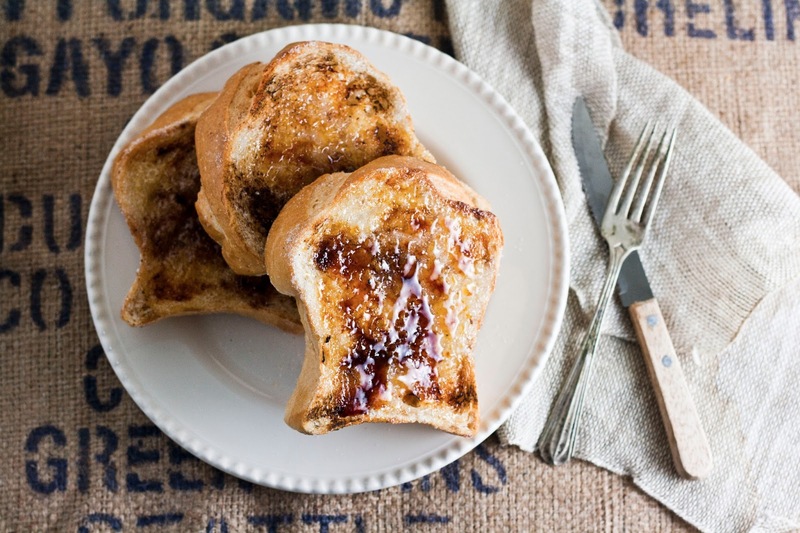 Generously sprinkle ground cinnamon over both sides of the toast — I used around 2 tablespoons. 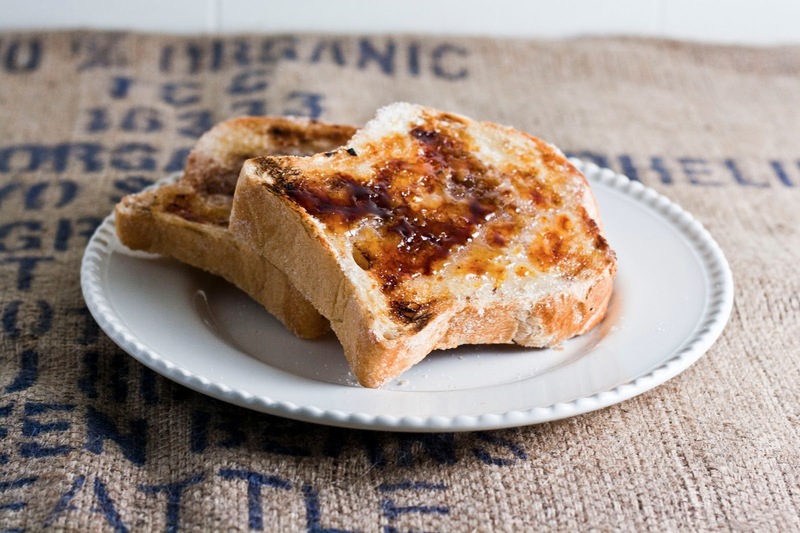 Put 2 cups granulated sugar in a shallow container or a plate and dip each piece of toast in the sugar, then sprinkle on a bit more sugar to coat evenly. Repeat on the other side of the bread so that both sides will be covered in sugar. Make sure that the cinnamon you sprinkled is completely covered by sugar, or else the cinnamon will burn. Place the toast on a metal cooling rack set over a sheet pan. 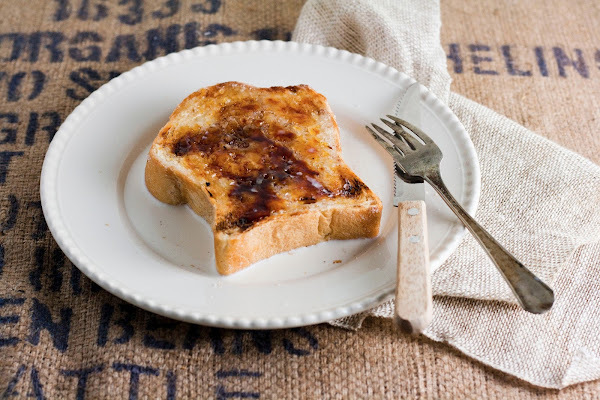 Use a Chef's culinary torch to melt the sugar with a torch, keeping the nozzle about 2 -3 inches from the toast. Keep the flame moving across the surface of the toast to avoid burning one spot, and avoid torching the edges of the bread because unsugared bread can ignite. Stop torching before the sugar turns dark brown — it will continue to darken on its own. Repeat on the other side until both sides of the toast have been brûléed. In a liquid measuring bowl, whisk 2 cups half-and-half together with 3 oz. sweetened condensed milk. 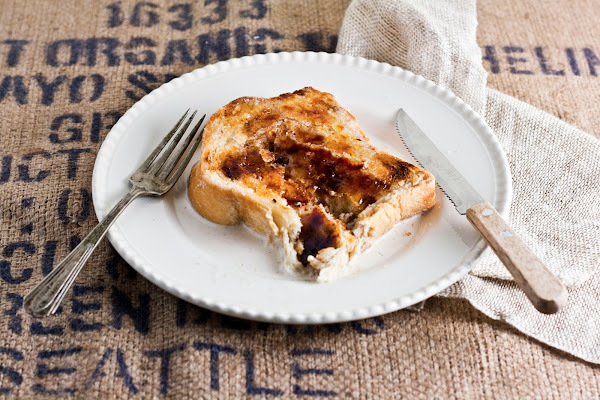 Pour a generous amount of sweetened half-and-half cream over each piece of brûléed toast. Serve in a hefty puddle of cream and top with cinnamon. french toast is my favorite sweet breakfast! I love cinnamon! I could eat like half a box of CTC (Cinnamon Toast Crunch) back in the dorms in college... before I knew I can't eat grains or wheat! Oops!! But, very tasty! Your french toast looks totally delicious! this makes my mouth water! also, i like how your negative points about san fran seem to be practical/social/economic/whathaveyou, while your positive points are mainly about the food haha. but to be fair, these food places you mention make my mouth water a little too! Okay woman you're a genius at making people click around because I started on your current post and have been reading various things you've linked to for the past half hour. I can't leave. Your writing draws me in so well and you make everything sounds like MUSTMAKENOW. I was actually vigorously nodding along with your thoughts on SF (I'm originally from a suburb very close to SF)--I don't actually love it as a city that much. Like it would never be my first choice to live in. But now that I live in a different state, going back to visit is much more enjoyable--like you said, so many AMAZING food options there! Sigh. And this French toast sounds out of this worldd.